Day 01: Arrival at Paro (2250 mtrs) from Kathmandu and transfer to Thimphu. As your flight lands in Paro .You will meet our representative at the airport and will be driven to Thimphu, Check in hotel. If time permits visit Tashicheo Dzong. Day 02: Thimphu(2350mtrs) and after lunch drive to Punakha. Today you will do Thimphu sight seeing till lunch. Zorig Chusum (commonly known as the Painting School) where students undergo a 6-year training course in Bhutan’s 13 traditional arts and crafts. Later visit Folk Heritage Museum, a fascinating testimony of the Bhutanese material culture and living traditions. Phelchey Toenkhyim (Folk Heritage Museum), is dedicated to connecting people to Bhutanese rural past through exhibits, demonstrate, educational programmed and documentation of rural life. The principal exhibit in the museum is a restored three-storey traditional building, rammed with mud and timber, which dates back to mid 19th century. In order to present a typical Bhutanese rural setting flavor, paddy, wheat and millet fields, a traditional watermill (with mill stones that dates back more than 150 years), traditional style kitchen gardens with vegetables that were grown and consumed over 100 years, and the famous hot stone bath complement the museum building and exhibition within. Drive to Punakha (driving hour 2.30hrs), the old capital of Bhutan. Drive over a pass (Dochu-la 3150mtrs).La in Bhutanese means pass. There are 108 chorten called “Druk Wangyel Chorten” with colorful prayer flags surrounding the area, which makes you fresh and feel peace.Visit the Druk Wangyel monastery. (6,960m), Terigang (7,060m), Jejegangphugang (7,158 m ), Kangphugang (7,170 m ), Zongphugang (7, 060 m ), a table mountain that dominates the isolated region of Lunana, finally Gangkar puensum, the highest peak in Bhutan at 7,497m. Day 03: Punakha (1350 mtrs) and after lunch drive to Gangtey. 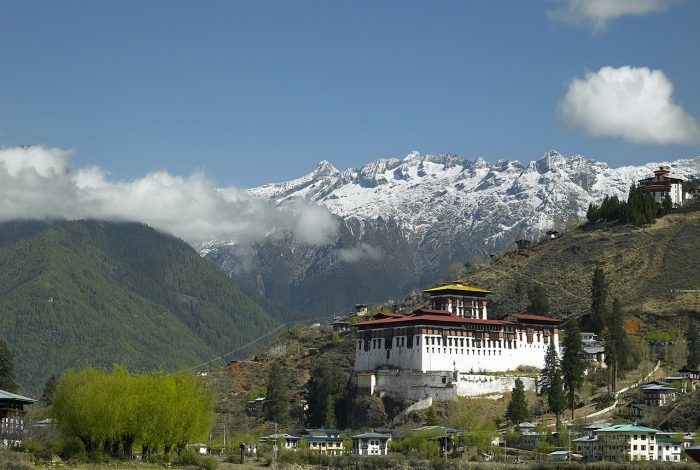 The Dzong was built in 1637 by the unifier Zhabdrung Ngwang Namgyal and it was named as Pungthang Dechen Phodrang (Palace of Great Happiness). 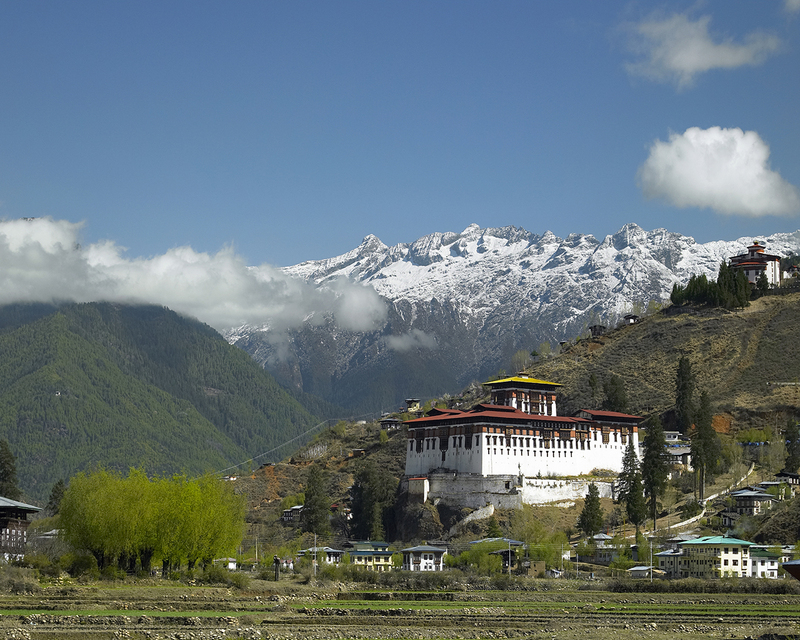 The Dzong is beautifully located in between the two rivers called Pho (male) and Mo (female) chhu (river). The Dzong is surrounded by stories and myths, and you just have to ask your guide or local people they will have some great stories of the past. It was the capital of Bhutan till 1955. The establishment of the Wangchuck dynasty on 17th December, 1907 took place here and the first National Assembly was also held in the Dzong in 1953. Punakha dzong continues to be the winter residence of the Je Khenpo (Chief Abbot) and the central monk body.The war materials captured during the Tibetan invasion can be found in the dzong. Chimi Lhakhang, is a small 15th century temple famous for its fertility endowments/rites due to the blessings of Lam Drukpa Kuenley in west known as Devine Mad Man. The temple sits on a hillock shaped, as only Drukpa Kuenley could describe it “like a woman’s breast”. The word ‘Chimi’translates as “No Dog” and is traced to the story of how Drukpa kuenley subdued the demons of Dochula. Apparently, Lam Drukpa Kuenley had followed the demons of Dochula down to the velley of Punakha and Wangdue. It is believed that the demons had disguised herself into a form of dog. He then subdued the dog and buried it under a mound of earth, marking the place with a stupa and making a prophecy that a temple would be built on the spot in future. The temple houses the Lam’s iron bow and arrow, a small altar chorten made by the Lam himself and some of his personal effects scriptures. A wooden effigy of Drukpa Kuenley’s male organ is used to bless pilgrims, particularly childless couples or those who have suffered miscarriages or early deaths of their children. Children born under such circumstances under the patronage of Drukpa Kuenley are often named Kuenley or Chimi in honor of the saint and the place. After visiting Chimi lhakhang you will have lunch in a restaurant facing the lhakhang. After lunch we drive to Gangtey and over night in Gangtey. Day 04: Gangtey sightseeing and, later drive to Thimphu. Gangtey one of the few glacial valleys in Bhutan, which lies in the mountains,east of Wangduephodrang. After breakfast first visit the crane information centre and later visit the great monastery of Gangtey, established in the 17th century. The village of Phobjikha lies in a few kilometers down from the monastery, on the valley floor. This quite, remote valley is the chosen winter home of rare black necked cranes, which migrate here annually from the Tibetan plateau. Many visitors refer to this place as heaven on Earth. Have lunch in Lobesa and continue to drive to Thimphu. Overnight in Thimphu. After breakfast drive to Paro for sightseeing in Paro. Rinpung Dzong: Built in 1646 by Shabdrung Ngawang Namgyal, the “fortress of the heap of jewels “stands on a hill above Paro Township. The approach to the Dzong is through a traditional covered bridge (called the Nemi Zam) and then up a paved stone path running alongside the imposing outer walls. The valley’s annual springtime religious festival, the Paro Tsechu, takes place in the courtyard of the Dzong and on the dance ground on the hillside above. Kyichu Lhakhang: This Lhakhang(monastery),built in the 7th century, is one of the two oldest and most sacred shrines in Bhutan (the other being Jambey Lhakhang in Bumthang). Kyichu Lhakhang is composed of twin temples. The first temple was built by the Tibetan king, Songtsen Gampo in the 7th century. In 1968, H.M. Ashi Kesang, the Queen Mother of Bhutan, arranged for a second temple to be built alongside the first one, in same style. Taktshang: After an early breakfast visit the Tiger’s nest (Taktshang) Hike up to the famous cliff-hermitage called Taktsang, the “Tiger’s Nest.” This monastic retreat is built into a sheer cliff face, high above the Paro valley. The Buddhist saint Padmasambhava flew across the Himalayas on the back of a tiger and landed here, bringing Buddhism to Bhutan. The trail to the monastery climbs through beautiful pine forest and an occasional grove of fluttering prayer flags. Taktsang was damaged severely by fire in 1998 and restored new one which looks like the old one but more elegant lookings. Have lunch at the Cafeteria when you walk back from the Taktshang. Later in the afternoon take some rest and you can enjoy the Paro town. Overnight in Paro. Day 07: Fly back to your next destination. After breakfast, drive to airport for your onward destination. Our representative will help you with exit formalities and bid you farewell.